The Inglewood Landcare Group with assistance from the Loddon Plains Landcare Network undertook spraying of Bridal Creeper at the Inglewood Morning Star Reserve in early October. The 39 acre public reserve in Inglewood formed the basis of the Network’s Bridal Creeper project. Training in chemical use in March allowed the volunteers to undertake the spraying with the assistance of a works crew. The Network also hosted a Weeds Night in Inglewood as part of the project. 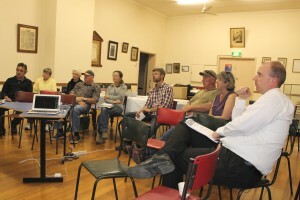 Attendees heard from three speakers including the Network’s Facilitator Anthony Gallacher, Jeroen van Veen from Bush Heritage and Ian McLauchlan from the Loddon Shire, who all talked about various local weed issues. The project was funded through a State Government Victorian Landcare Grant from the North Central Catchment Management Authority. Many thanks to all those who got involved. Photo: Attendees at the Weeds Night in Inglewood.